Bounty Bay Online (BBO) is a MMORPG, developed by "Suzhou Snail Electronic Co., Ltd". Basically every player plays the role of a character during the time of exploration and pirates a few centuries ago. You can chose what type of character you want to play, be it simple farmer, skilled craftsman, smart merchant, driven explorer or ruthless pirate. 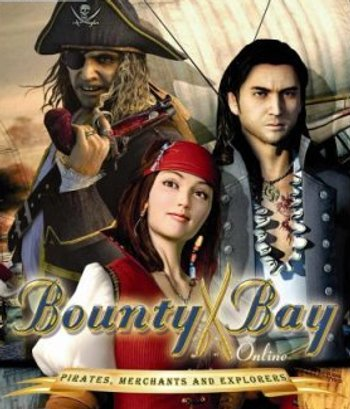 You can freely chose which avenue to go in Bounty Bay Online! Sea battles of epic proportions, sunken treasures, conquering towns and discovery of long forgotten locations are only a few of the things waiting for you in Bounty Bay Online. The game world will be the known world of the 14th to 16th century. Hundreds of genuine ship models. More than 60 historically correct towns and harbors. Players can influence the game world via politics. Buccaneers and Letters of Marque. A master - Apprentice System. Extensive Quest system with dynamic and static quests. Thousands of items, trading and crafting goods. Player vs. Player (PvP) - system. Realm vs. Realm (RvR) or better Nation vs Nation (NvN) - system. Guild compartments, Guild ranks and charges. Guildhall where you can set up your guilds charta, politics etc. Guilds can control Cities, set up blockades and tolls and much more. Sunken treasures and lost cultures. Monsters and creatures from the real fauna. Mythical creatures from different cultures and mythologies. Individual character creation with clothing and items. Different ranks in the different categories like sea fights, sword fighting etc. Customizing of ships with different paints and sail patterns and much more. Different figureheads with different properties. There will be no classes in Bounty Bay Online. Every player can chose whatever way he wants to go and during his career he can learn more than one skill. The player is free to choose which of the skills he wants to learn. Instead of races we have the different seafaring nations from the 14th-16th century in Bounty Bay Online. The nations have different skin color and clothing and at the start of the game, each player can chose which nation he wants to play. The number of nations available at the start of the game has yet to be determined. The ships in Bounty Bay Online are similar to the real ships from the 14th to 16th century. The ships vary in class and size and nationality. There are three basic ship classes: The Explorer class with average armament and cargo capacity, but with high speed. The War class with slow speed and low cargo capacity, but with above average armament with very high firepower. Every player starts with an small explorer type ship and during the course of the game he can buy new ships or upgrade his existing ships. How many ship a player owns is totally in his own responsibility, but he can command only one ship at any given time. Because you need different skills to command the different ship types it won't make much sense to fill up your inventory with lots of different ships. We can't give you an exact number how many different ship types will be available, because new ships will be added to the game from time to time. The level system in Bounty Bay Online is one of the most sophisticated of it's kind. A character doesn't level as a whole, but instead you level in different aspects like seafights, melee and ranged combat, craftmanship and so on. Because we haven't finalized all aspects of the level system, a comprehensive level guide will be published at the start of the open beta. The PvP system in Bounty Bay Online will be one of the most comprehensive to date. Basically a player is PvP enabled as soon as he leaves the safe waters of his harbor. You always have to reckon on pirates to attack you on the open sea. Additionally there are undiscovered territories on land where you can be attacked and ambushed by others at all times. As a player you also have to account the political situation, because there will be buccaneers with their letters of marque trying to raise their fame glory by attacking enemy nations and sinking enemy ships. The last PvP option will be guild wars, where different guilds fight about the control of vital towns or goods. Guilds will be an integral part of Bounty Bay Online, because only guilds can capture Cities and ports. If a city controls a City, those guild also controls and can change the infrastructure . A guild can set import and export taxes and trade embargoes and guildwars. The guilds are structures with the help of different guild ranks and every guild has a guild headquarter where mercenaries, guards and elite ships can be hired or different benefits for the guilds artisans, warriors and merchants can be set up. A lot of cities can be captured and controlled by guilds, but certain fortifications and capitals can't be captured. There will always be safe harbours for each nations, where you can dock your ship. There will be different crafting professions in Bounty Bay Online. You can craft armor, weapons, heal potions, ships and much more, but you need resources that you need to harvest or mine. Those resources can then be processed to goods of different quality. The quality level of the manufactured goods will be determined by the skill of the player. If you are a member of a guild there will be additional crafting features in the guild headquarters and it will be easier to craft high level goods, if you are a member of a guild. There will be a lot of different quests and adventures in Bounty Bay Online. We are determining at the moment, which quests we will incorporate at the start of the beta. Because we are changing the quest system at the moment, we can't give you any more details now, but will tell you more at the start of the open beta. We can assure you that there will be enough "high level content" at the start of the game, as there will be high level quests as well as events for our players. In addition to the quests there will be in-game events as well for our players. Some events will be announced before they'll start and there will be other events where we won't do that. What is true for both types of events is, that you don't have to participate in them and that the balance between event participants and non-participants won't be skewed. This page last modified 2008-05-01 03:15:10.